Steering Geometry: What is Trail? Trail is the distance the contact patch of the front tire lags behind the point where the steering axis intercepts the ground. Consider the casters on a shopping cart: the wheels are offset behind the vertical steering axis, and the force of the ground on the wheel tries to center the wheel on the direction of travel. The greater the distance between the steering axis intercept and the contact patch, the stronger the centering force becomes. For a given steering angle, offsetting the hub forward reduces trail, while offestting the hub backward increases trail. This may seem counterintuitive, since very stable cruiser bikes usually have more fork rake than twitchy track bikes. But the other factor at work is the angle of the steerer -- cruiser bikes have very slack head tubes, so they have more trail despite their fork rake, not because of it. or by any combination of these methods. For a given steering angle and fork offset, the trail is the same regardless of how the offset is obtained. A straight bladed fork with 45mm of rake has exactly the same trail as a curved-bladed fork of the same length with 45mm rake. All that matters here is the points at the fork crown and the dropouts, not the shape of the fork between them. 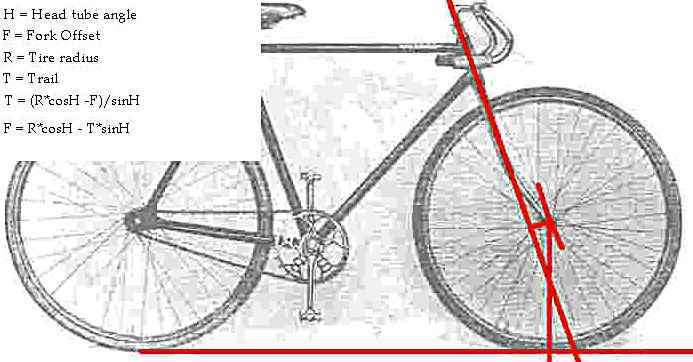 The image below diagrams the geometry of a 1930s racing bike. You can do the same for any bike. It's easiest with a scale drawing or a good photograph. Draw a line down the center of the steering tube and extend it to the ground. Drop another line from the center of the front hub perpendicular to the ground. The distance between the contact patch and the steering axis/ground plane intercept is the trail. As shown in the formulas on the left, trail can be calculated given the head tube angle, the radius of the inflated tire, and the amount of fork offset. For someone designing a fork, it is more useful to start with the desired trail and calculate the needed fork offset, which can be determined from the tire radius, head tube angle, and trail.